After the creation, the application is sent for approval to the head of the department. All notifications are sent to the work mail, and also displayed in the “Requests for absence” information panel on the Home page. 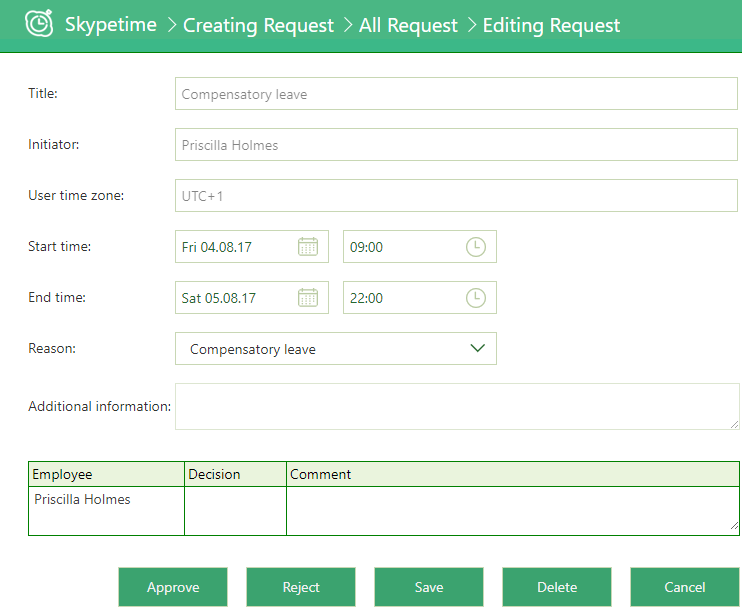 To make a decision on the request, the Manager can either from the interface or the answer to the incoming letter. The first way: you need to go to the section “All requests”, open an application with the status “New”. The page for editing the request will open, from here the application can be “Approved” or “Rejected”, in addition, the Manager can leave a comment. The second way: from the notification panel, you can perform the following actions: Approve, Reject or mark as read. After the decision has been made, a notification with the updated status of the application is sent to the user.